What Happened In 2017: Began the season on the disabled list, made a few spot starts in the majors, wasn’t terribly effective, almost a wasted season. Brock Stewart came into the 2017 season looking to crack the Dodgers’ rotation. But with many veterans ahead of him on the depth chart — and the fact he had options remaining — meant it was going to be a difficult task. 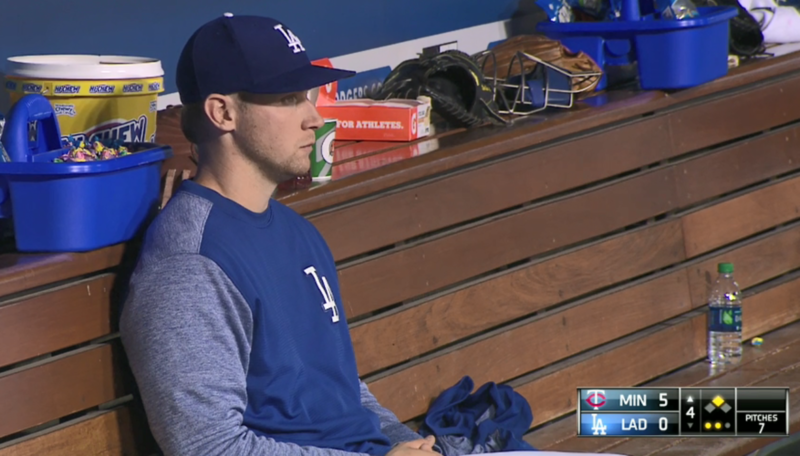 Unfortunately, he didn’t give the Dodgers much reason to earn an Opening Day spot on the pitching staff after allowing seven runs on five hits in just 3 1/3 innings in Spring Training. There was a reason for the poor performance: Stewart had a sore shoulder. It landed him on the 10-day disabled list to begin the season. Bum shoulder, but at least he was collecting an MLB paycheck…? He then went on a rehab assignment to Rancho Cucamonga at the end of May and, well, that didn’t go well. He allowed three runs and six hits while recording just one out. He was transferred to the 60-day DL, but it was mostly a procedural move. His next outing came at Triple-A Oklahoma City, and he looked like his old self for a few outings, even if they were shorter-than-normal outings (2-3 innings). The Dodgers recalled him on June 18 and he made his season debut in a 12-0 win over the Mets in LA, where he threw three scoreless innings and struck out four. He was back … until he wasn’t. The Dodgers optioned him back to Triple-A three days later, but before he could make an appearance down there, he was recalled on June 26. In his second stint, Stewart pitched mostly in mop-up situations, but he did threw in a few close games. On July 26, he got his first start of the season. The Twins were in town and he had thrown 10 scoreless innings of relief in the past month before his start. It didn’t go well, as he allowed five runs in 3 2/3 innings of work. The Dodgers eventually won the game, but it wasn’t a great outing for Stewart. He made his next start in Atlanta and was better, but still not up to his standard: 4 IP, 2 R, 3 BB, 1 K. He would then ride the option train again the next day before being recalled five days later. He made a forgettable start on 11 days of rest in Pittsburgh (2 IP, 4 H, 5 R, 4 BB) before — you guessed it — getting optioned to Triple-A. Stewart was up for good in September and was on the periphery of maybe being considered for the postseason roster. He had a 3.48 ERA, but his command wasn’t where it needed to be, as evidenced by his high walk rate (17.4 percent). Ultimately, he was left off all the postseason rosters. Despite seemingly treading water for a year, there was some good. Among relievers with 50 batted ball events, Stewart had the 3rd-lowest exit velocity against at 81.2 MPH. We know the Dodgers’ front office likes guys who prevent hard contact, and Stewart did just that as a reliever. That’s probably where his future lies, but he might get another shot or two in the rotation. It was a bit of a lost, shaky, up-and-down season for Stewart who had burst onto the scene a year prior. He still has a valuable arm and skill set that should make him an affordable and useful arm for the Dodgers going forward. 2018 Status: The 26-year-old still has options, so he might end up in Triple-A to begin the season. If he makes the MLB team, it’ll likely be out of the bullpen. He could also be an interesting trade chip, but I’d rather the Dodgers kept him. He’s making the MLB minimum and isn’t arbitration-eligible until 2020.